When I made the Veggie Potpie Stew, I mentioned never having made an actual pot pie before. This isn’t strictly true. When our stove went out, I did mess around with a slow-cooker potpie recipe. While that didn’t qualify as a traditional potpie, per se, it was the same general concept with all the traditional flavors. 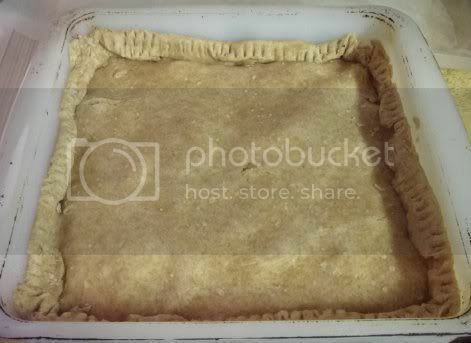 But the other day I had a little time to devote to the true potpie experience. 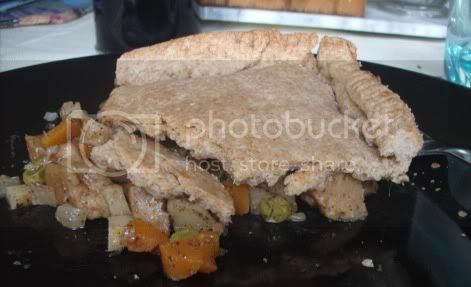 Or, at least, the vegan potpie experience. Having made a fresh batch of seitan earlier in the week, I was itching to use it in a recipe. 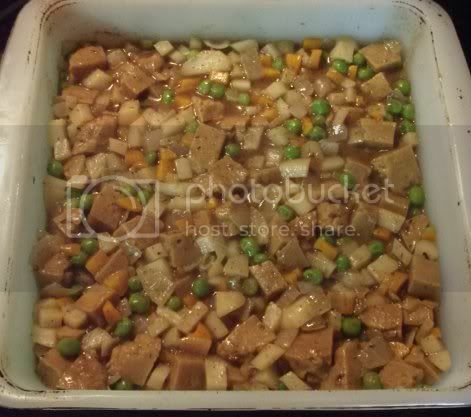 Veganomicon‘s Almost All-American Seitan Pot Pie sounded like just the thing. Reading the recipe, I figured it would take me at least two hours to prepare and cook. Undaunted, I settled on it for dinner. Yes, I am crazy enough to make potpie in the summer! The first thing the filling called for was a roux made with chickpea flour, an ingredient I am always decidedly lacking. I want to give a shout-out to the awesome vegan community on Twitter for solving that one for me. All I had to do was ask about substitutes and I had an answer long before it was time to start cooking. YourDailyVegan recommended spelt flour, and that worked out just fine. 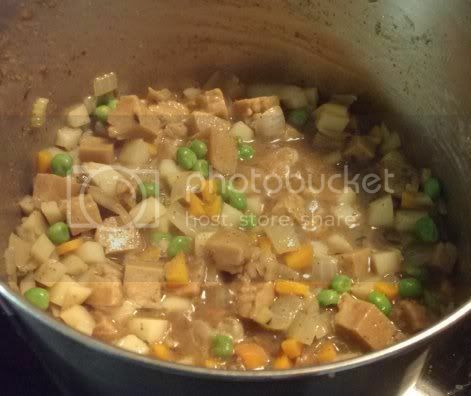 Everything else was typical potpie fare: carrots, potatoes, peas, seitan for the “meaty” part, and a tasty vegan gravy. I had a little trouble with the roux and wound up with a bit of a smokey kitchen, but somehow managed to avoid burning it. (Don’t laugh. I’ve never made roux before.) The crust was easier and came together without fuss. I only made half a recipe since I was feeding four people instead of eight. It looked kind of inelegant in the smaller casserole dish; I’d love to get individual pans for use in the future. That would certainly make it look more appealing on the plate. Despite kind of falling apart when served, this was very, very tasty! A slightly smaller casserole dish and a little more time rolling out the crust would make it just about perfect. I might also try using a mixture of peas and corn instead of just peas. Come to think of it, chopped mushrooms would taste good in the filling, too! Question for the comments: What labor-intensive recipes have you been waiting to try? Do you feel a good meal is worth spending a lot of time in the kitchen? Let me count the ways that I want to eat my computer screen right now. This looks amazing! Thanks! 🙂 It was definitely worth the work and the prep time.